I have really enjoyed Ackroyd's writing in the past. His London Biography, in particular, is an outstanding book. I had, therefore, high hopes for his life of Blake, the 18th century visionary being a famous Londoner and a fascinating man. I was a little disappointed. It's certainly learned and well researched (though it eggregiously overuses the word "vouchsafe"), but seems to skip over a number of important points: for one thing, Ackroyd hints darkly the Blake may have had misogynistic tendencies, but then declares "this isn't the place for a discussion of such things". Well, if a balanced biography isn't, I don't know what is. I've been reading Blake for close to thirty years (in Geoffrey Keynes' "Complete Writings"), but haven't found a satisfying and sympathetic biography until now. As one of the blurbers on the back cover points out, Ackroyd is a native Londoner—he has written authoritatively on its history—and this gives him a particularly fine vantage point from which to examine the life of a man who never lived or traveled more than 20 miles from the city. Ackroyd also is a student and admirer of Blake's epic poems, which are generally considered his most difficult work, and is able to explain them to me in a way no one else ever has. If he gives short shrift to Blake's epigrams and pithier poetic output, such as "Auguries of Innocence," that's fine with me, although I have always found them the most personally meaningful. They're easiest to grasp. For an author, Ackroyd also displays a deep knowledge of engraving and coloring, and gives wonderful context to Blake's eccentric illustrations. Blake would have been appalled at the idea of someone reading his poems without the art that accompanied them. A hundred pages into this book, I was questioning my total acceptance that anything written by Peter Ackroyd would be superb. By the time that I reached the end, I was sad to be leaving an old friend. 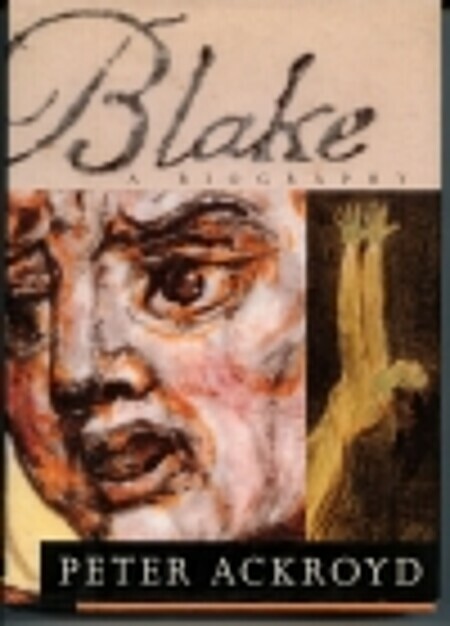 The reason for this sharp change of attitude to the book is caused, I believe, by the strange nature of Blake's life. He was not considered a great artist by most of the intelligentsia of his age and he wasn't always the most pleasant towards those who tried to help him. It took me a good one hundred pages to bend my mindset to that of Blake (at least Peter Ackroyd's Blake). The work is lavishly illustrated with Blake's engravings and they still have an unworldly feel: it is not surprising that people were bemused. Add to this the fact that Blake insisted that his images were divine presentiments and that he 'saw spirits', and one begins to see the oddity of the man. Ackroyd's admiration of the man shines through every page and, eventually, won me over, as Blake seems to have been able to gain forgiveness for his rudeness and quick temper towards his friends. He sold very few engravings and books during his life, but there always seemed to be a sponsor handing money to Blake. He was never rich,but he did keep the wolf from the door and in his last years, gained a glimpse of the fame that was to come posthumously.